We are proud to present Kazuya Kato in Arhus i collaboration with ‘Det Jyske Musikkonservatorium’, from where Kazuya is a former student. Please note: Tickets must be bought on beforehand, either online (https://musikhusetaarhus.dk/arrangementer/kazuya/) or at Musikhuset Aarhus’s ticket sales. AUT-members can enter at the door. The concept of this concert is based on Kazuya’s interest in music and the possibilities of the saxophone. His two main interests are musical energy flow and shades of time. Kazuya has chosen contemporary works for this concert, which he finds to really match these interests. Fantastic energy flow gives vivid emotion and impressions, just like famous books. When Kazuya listen to music, the length of time gets very abstract; in spite of two musical pieces having the same duration, some music feels long and some music feels short. Kazuya has chosen 4 Japanese pieces and 1 Danish piece for the concert. “Autopoietic Motion” and “Pellucid hawkmoth” are inspired from energetic action of creatures and process of evolution. The other two works by Hiroyuki Yamamoto focus on expressing the inside (back) of sound and contortions time under control. He often features microtones. He is very successful in creating unique, natural and organic acoustics by his essence. The Danish work, De Profundis, by Simon Steen-Andersen, is a very important work for Kazuya. When he listened to this fantastic work, he strongly felt that this piece would be a new masterpiece for saxophone – approx. 10 years ago. The work contains great details, wonderful timbre, arrangement, and the best thing of all: energy flow. For Kazuya, these things combined are uniquely found in this certain piece. In this program, Kazuya has chosen works with completely different styles, but all with their own unique languages. The language has their own timbres, colors, all of which interest and excite him. Kazuya invites you all to feel, listen and explore the music together. This concert is arranged by Aarhus Unge Tonekunstnere (AUT) in collaboration with The Royal Academy of Music, Aarhus. 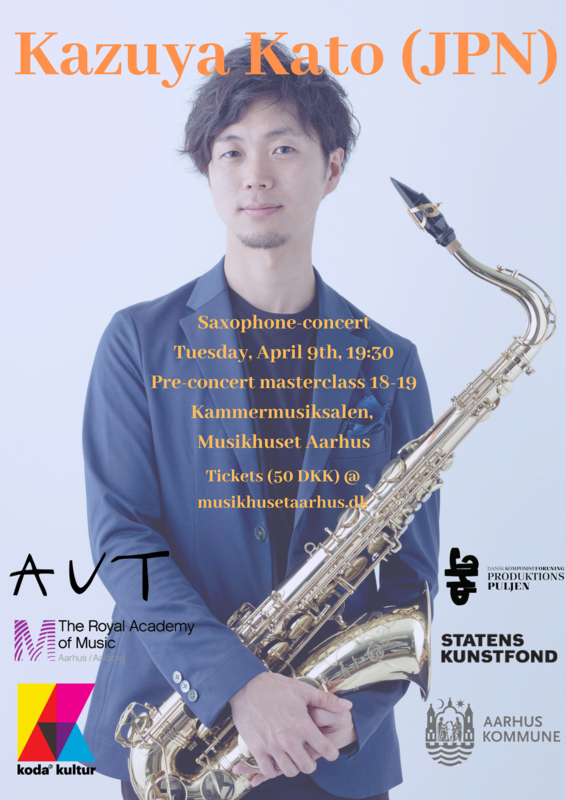 The concert will be held as a culmination of a two-day workshop with the academy’s saxophone class and it will also feature a short presentation/masterclass with Kazuya, presenting the different pieces and their various techniques and aesthetics, prior to the concert, at 18.00-19.00. Both events are held in the Chamber Music Hall at Musikhuset Aarhus. The masterclass is free of charge. Concert is free for AUT-members, 50 DKK for non-members. Membership can be purchased for 150 DKK (100 DKK for students and people under the age of 26). AUT is supported by The Danish Arts Foundation’s Committee for Music Project Funding, Danish Composers’ Society’s Production Pool, KODA Culture, and Aarhus Municipality Music Committee.